Found in July, 2007.I-Panda is a professional manufacturer of new energy products.We specialize in car inverter,industrial inverter, solar/wind inverter, MPPT solar charge controller, solar/wind generating system, UPS and so on.Our products have passed the international certifications of TUV, CE, FCC, CB, CSA, and successfully used for powersecurity service in national key projects including high-speed rail, metro, CCTV mobile control room, 2010Guangzhou Asian Games and 2011 Shenzhen Universiade etc. They are used to the fields of electricity, fire fighting,transportation, finance, construction, and widely exported to over two hundred countries and area, mainly inEurope, Asia, America, Oceania, Africa. 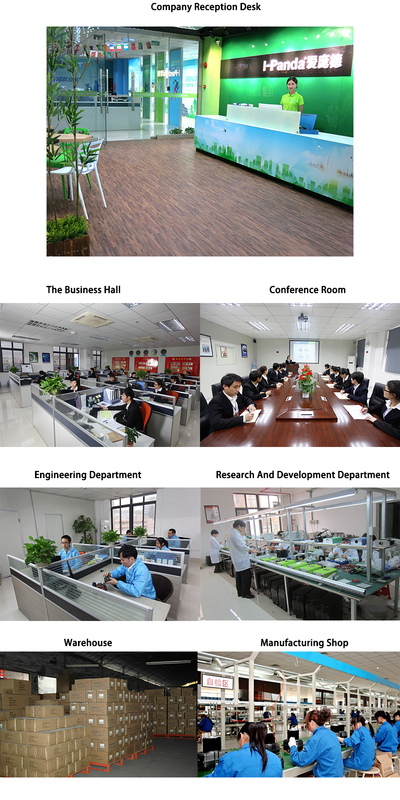 Combined pratical experience, I-Panda made four management systems to complete enterprise management. Thefour management systems include quality control system, production control system , engineering managementsystem, eco-management system.The production procedure is also operating strictly according to the IS09001/2000 system. These make sure the enterprise develop fast and steadily in these years. "Long-term cooperation and co-win development" is the business theory of I-Panda.Based on professional strongtechnical team and professional normative service platform.I-Panda continuously have been providing high qualityproducts and also OEM and ODM service.Due to our efforts,we have gained a good reputation from customers allover the world. Work with I-Panda, work with a good partner. We are looking forward to cooperating with you! Development- Enterprise develops together with the employee,customers and society. Your visitation are welcome to I-Panda.